Our 50-STATE Legal NFA trust was designed from the ground up by an experienced gun trust attorney to address issues relating to the use, possession and transfer of firearms, specifically those included in the National Firearms Act (NFA). This is not a generic trust form offered everywhere else and this one Trust can allow the easy transfer of thousands of NFA items. Short-term or Long-term co-trustee appointment at any time without amending the trust - want to add a buddy for your upcoming hunting trip? Instant removal of Co-Trustees at anytime without amending your Trust - perfect for mitigating 41F rules. Instant Email Delivery with detailed instructions - unlike other options, ours is delivered in real time, not 24 hours later. After purchasing, you will be prompted to fill out a short online questionnaire. Your personalized trust and instructions are provided via email immediately upon completion of the questionnaire. The questionnaire can be completed anytime and only the settlor / initial trustee (you) need to sign in front of a notary to establish the trust. Capitol Armory provides notary services free of charge for customers. Gun Trust powered by GunTrustGuru.com. I was under the impression that all trustees needed to have finger prints submitted, how to you get around this? All co-trustees at the time of purchase are required to provide fingerprints. There is not a way to get around that. Our trust is established with a single trustee and you can add trustees after your purchase. Should you decide to add trustees after your purchase is made, there is not a requirement to provide fingerprints or photos for previously purchased / transferred items. I had my trust done through you guys. After I take possession of my suppressor, don't I have to add to the trust with the serial # and the stamp? If so, where do I write it down? Not with the Trust provided on our site. The Trust is written in such a way the eliminates the need to write down each NFA item in a seperate schedule. Simply store each original Form 4 or 1 with the original Trust and there is nothing else you need to do. We can use the same Trust from a couple years back, but we will need you to provide fingerprints for us one time. You can do so at our shop, at a Sheriff's office or local Police department or make an appointment at a local identogo office. Once you purchase from us, we will send you a full set of instructions on where / how to get the prints done local to you. What is the process to adding some one to the trust say for an upcoming hunting trip as stated in description? & I live in Michigan I am curious if I need to go threw FFL to receive a suppressor if ordered from u guys of can get it in the mail? There is an addendum within the Trust we sell that allows you to permanently or temporarily add Trustees to your Trust. It is as simple as both parties signing before a notary. In short, the NFA Trust allows multiple people to posses the suppressor and upon death of all co-trustees, easily allows the transfer to beneficiaries without additional ATF paperwork. If you transferred as an individual and passed, the heirs of your estate would have to file paperwork with the ATF. The Trust future proofs your purchase in the event the ATF decides that the transfer of suppressors, SBRs or machine guns is prohibited. does the trust need to be filled out at the initial purchase time or completed by the time the suppressor arrives and is released to purchaser? I am a trustee added to my friend's trust.When the Trust purchases a new suppressor from Capitol Armory, can that suppressor be shipped to me upon arrival?Both the Trust and myself are domiciled in Texas. I hold a Texas CHL. Yes, once approved we can ship to any co-trustees residence. If you bought before 7/13/2016 (pre-41F) you would need to posses a LTC / CHL. If you bought after 7/13/2016 then it can be shipped to any co-trustee with a TX DL#. I live in Texas. 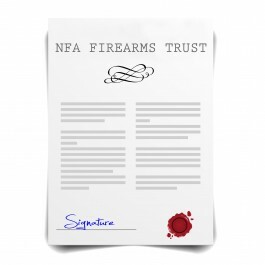 Does the NFA Trust require 2 witness signatures for the notarization? That is difficult for me to accomplish. Thank you. No witnesses are required with our Trust. It only needs to be signed by the Settlor in front of a notary. Yes. Our trust is 50 state legal. once ive filled out the trust and have had a notary sign, do I need to email a copy of all the signed paperwork back to you guys? We only need the signed, first 12 pages. We do not need the co-trustee addendum or schedule A.